Board the flight for Chennai. Upon arrival at Chennai International airport meet with our representative at arrival lounge and transfer to the hotel. Overnight stay at hotel. In the evening transfer to Chennai railway station to board an overnight sleeper train to Trichy. Overnight stay on board. Upon arrival at Trichy railway station meet with our representative and transfer to the hotel. After fresh-n-up visit Srirangam, which is an island, 5 kms from Trichy. 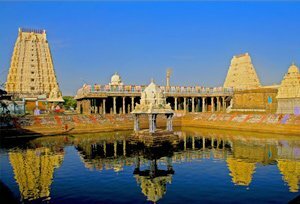 Surrounded by the Kaveri water is a 600 acres island town enclosed within the seven walls on the gigantic Sri Ranganathaswamy temple. There are no less than 22 gopurams, one of which is the tallest in India. The 72 m high 13 tiered gopuram dominates the landscape for miles around. The Rock Fort situated on the banks of the Kaveri River, Trichy's most famed landmark is an 84 m high rock, one of the oldest in the world approx. 3,800 million years. The attraction is not for fort itself but the temple at the summit. 344 steps hewn out of rock lead to the top where are the inscriptions dating back to the 3rd century B.C. Today we will leave for Madurai, en-route visit Thanjavur. The home of Carnatic music, musical instruments, dance and traditional handicrafts, Tanjore (Thanjavur) is famous for the Brahadeeswarar Temple. The temple constructed more than a thousand years ago by the Chola King Raja Rajan is an architect's marvel. 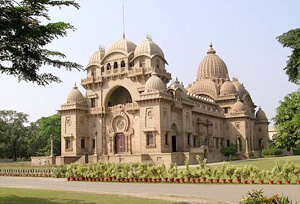 The Art Gallery and the Saraswathi Mahal Library are also well known places of interest. Further continue drive to Madurai. Upon arrival check into the hotel. Overnight stay at hotel. After breakfast we will go for full day city sightseeing tour of Madurai. Madurai, known as Athens of the East, is the second largest city on the banks of the River Vaigai. The city is believed to be more than 2500 years old. The city got its name from the drops of nectar (Mathuram) that fell from Shiva's lochs when he came to bless its people for constructing a temple for him. 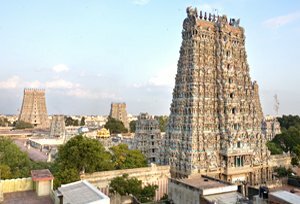 Madurai where the people wake up at the chant of hymns is proud of the magnificent Meenakshi-Sundareswara Temple. 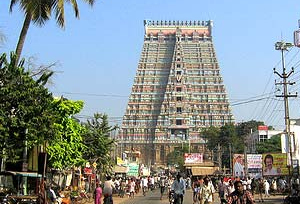 Of its 12 gopurams, four of the tallest stand at the outer walls of the temple. The 48.8 m high southern gopuram is the most spectacular and have over 1500 sculptures. In the Ashta Shakthi Mandapam inside the Meenakshi temple, the sculpted pillars tell the story of the beautiful princess of Madurai and her marriage to Lord Shiva.Evening transfer to hotel. Overnight at hotel. If evening boat ride is not possible, then we will enjoy morning boat ride on Periyar lake for wildlife viewing. Return to hotel for breakfast. After breakfast leave for Cochin, the capital city of Cochin and gateway to south India. Upon arrival check into the hotel. Overnight stay at hotel. 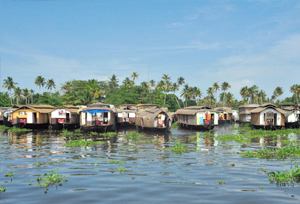 Today we will have full day guided tour of Cochin, - the commercial capital and the most cosmopolitan city of Kerala. Visiting The Dutch Palace, Synagogue, the famous Chinese fishing nets. Afternoon free to go around to explore it spice market or enjoy some local shopping. Evening Kathakali Dance Show (Optional). Overnight at Cochin. Later we will return to Hassan for overnight stay. Morning temple tour of Hassan. Hasanamba Temple is 800 years old and houses the main deity of Hassan. The temple is dedicated to Amba also known as Goddess Shakti. The goddess here is an anthill or (hutta in kannada) which denotes Hasanamba is actually goddess Parvathi. The Inner sanctum opens only once a year for two weeks during Deepavali and closes three days after Balipadyami. When the temple is closed they keep before the goddess a lit lamp two bags of uncooked rice, water and flowers. Later in the afternoon leave for Hospet. Upon arrival check into the hotel. Overnight stay at hotel. Morning after breakfast an excursion to Hampi. 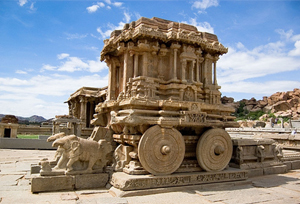 Hampi, the seat of the famed Vijayanagara empire was the capital of the largest empire in post-moghul India, covering several states. The Vijayanagara empire stretched over at least three states -Karnataka, Maharashtra, and Andhra Pradesh. The destruction of Vijayanagar by marauding Mughal invaders was sudden, shocking and absolute. In the afternoon, proceed for a local sightseeing tour of Hospet. Overnight stay at hotel. Morning after breakfast leave for Badami. En-route we will visit Aihole & Pattadakal. Pattadakal, referred to as Petrigal, reached its pinnacle of glory under the Chalukya kings from 7th to 9th centuries. The oldest in this group is the Sangameswara Temple. The Mallikarjuna Temple has pillars depicting life of Krishna. Virupaksha temple has sculptures and panel scenes from the epics, the Ramayana & Mahabharata. The Papanatha Temple has impressive carvings on pillars and ceiling. Further continue drive to Hampi. Upon arrival check into the hotel. Overnight stay at hotel. 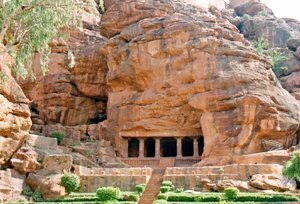 Morning visit Mahakoota temples and Badami rock cut caves. Badami also known as Vatapi is rich with Hindu and Jain temples carved out of sandstone hills. The carved temples date back to the 6th century. Of these, three are Hindu and one Jain. Sculptured out of solid rock they are adorned with carvings. The Fort, on top of a hill encloses large granaries, treasury & a watch tower. The Malegitti Shivalaya temple set on the summit of a hill is built of stones without mortar. Later in the afternoon leave for Goa. Upon arrival check into the hotel. Overnight stay at hotel. Full day leisure or to enjoy the water activities in Goa. Overnight stay at hotel. Morning free at leisure. in the afternoon transfer to the airport to board the flight for Mumbai. Upon arrival transfer to the International airport through airport shuttle service to board the flight for onward destination.